The brutal and indiscriminate attack upon the people and infrastructure of Lebanon by the Zionist State "Israel" is a crime against all basic standards of decency and humanity. Of course, voices may be heard that the IDF are simply responding. This, of course, ignores the question of the evil, implicit in punishing blameless people for the deeds of others. And it totally ignores the root of the problem, the dispossession and subjugation of the Palestinian people which began in 1948, was expanded in 1967 and continues unabated to this day. 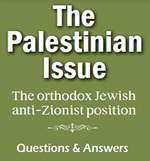 The crux of the matter is that beyond the immorality of the Zionist treatment of the Palestinians is the ultimate fact -- the ideology of Zionism and ensuing establishment of the Zionist state conflicts with the basic teachings of Judaism. Zionism is the transformation from Judaism, a G-dliness and spirituality, into a G-dlessness, materialism with nationalistic aspirations. Theodor Herzl and his cohorts, the fathers of this relatively new ideology of Zionism (approximately 100 years), have taken the Almighty out of the equation. The ultimate establishment of the Zionist State, the fulfilment of the Zionist ideology, takes this blasphemy a step further. The Jewish people were sent into exile by Divine decree. They where then expressly commanded by the Almighty, not to attempt to leave their exilic existence through any human intervention. They were expressly forbidden to create their own state, such as the Zionist state of "Israel". (Talmud, Tractate Kesuboth, p.111). The Jewish people are forbidden to oppress another people. The creation of the State of "Israel" came about through, the theft from, subjugation and oppression of, the Palestinian people. Torah Jewry, therefore, condemns the horrifying suffering inflicted upon both the Palestinian and Lebanese people. Because of all of the above, all attempts to achieve peace and stability for "Israel" are destined to fail. The Creator cannot be defied with impunity. The Rabbis stated, that the State of "Israel" will result in unending pain, suffering and bloodshed. May the Almighty protect His creations. The State of "Israel" does not speak in the name of Jews, they have stolen the name "Israel" from the Jewish people. Jews are commanded to be loyal citizens in every country in which they reside. Zionism and the State of "Israel", is the main cause of the exacerbation of anti Semitism universally. The government of the illegitimate State of "Israel", continually attempts to uproot the Torah and its statutes. They persistently oppress the Torah true Jews who reside in its borders.